The new Parallels Desktop 4 has the feature that you can connect from your iPhone and iPod Touch (iPod Touch compatability is not mentioned anywhere, but it downloads and runs OK). 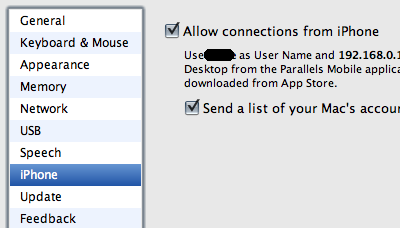 The setting to allow an iPhone to connect is in Parallels Desktop Preferences. After downloading the applet from the Apple Store, I put in the host details (IP address), and credentials, but kept getting an error connecting "an unexpected error occurred". After some trial and error, I found that the iPhone and iTouch rather helpfully capitalise the first letter of the username, which could be incorrect. When I changed the username on my iPhone to match exactly the machine's username, which is all lower case, it connected straight away. To get an all lowercase username, you need to move to between the first and second letters, put in the first letter again, then move back a space and delete the first letter. Now, if only Parallels allowed the screen to rotate to match the landscape of most computer screens! Help - I think I'm being very thick here. You talk about downloading an applet - but which applet do you download. I am still unable to see my iphone in itunes despite turning iphone on in Parallels settings as you suggest. Any further suggestions???? You need to search for and download the Parallels app from the App Store.